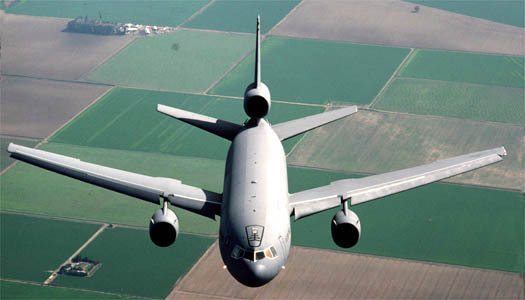 The KC-10s can carry more than 356,000 pounds of jet fuel, which it delivers through a boom to aircraft in flight at a rate of 470 gallons per minute. It costs $86.3 million per plane, carries a crew of four, and can fly at 619 mph. 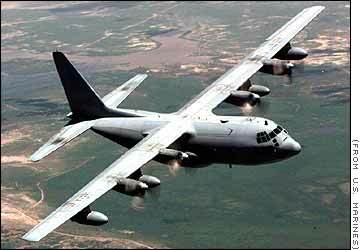 The KC-130 Hercules is a multi-role, multi-mission tactical tanker/transport primarily used for in-flight refueling by Marine Air Ground Task Forces. 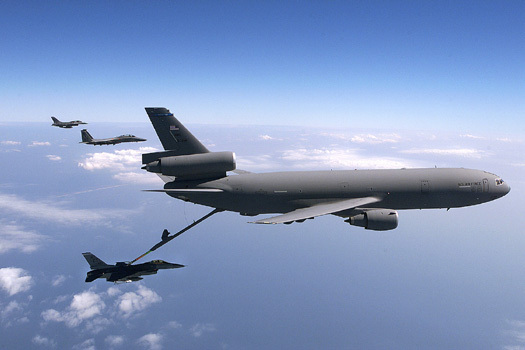 These versatile aircraft can also perform rapid ground refueling and aerial delivery of troops and cargo, tactical insertion of combat troops and equipment and evacuation missions. Length: Aircraft: 97 feet, 9 inches (22.16 meters). 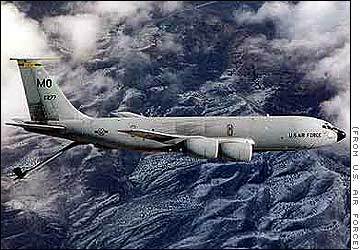 Range: Tanker mission: 1,000 nautical mile (1150 mile) radius with 45,000 pounds of fuel (20,430 kilograms) (KC-130R/T) Cargo mission: 2,875 nautical miles (3,306.25 miles) with 38,258 pounds (17,369 kilograms) of cargo (KC-130R/T) or 92 combat troops or 64 paratroopers or 74 litters. Maximum transfer jet fuel load: 200,000 lbs. Crew: Four and aircraft equipped with PACER CRAG do not have a navigator on most missions. The Air Force procured a limited number of navigator suites that can be installed for unique missions.